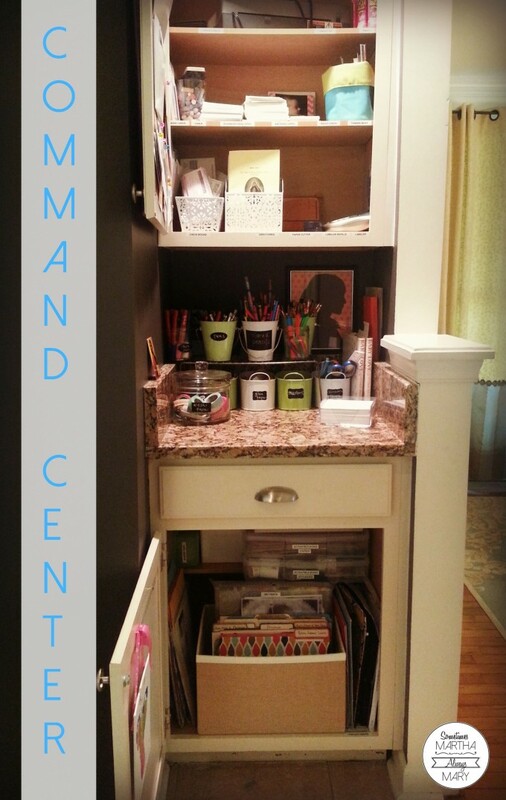 Yesterday I shared some ideas with you about how to organize all those school uniforms by creating a uniform command center. Today I’m talking paper and emails. In spite of the fact that so many teachers and administrators are utilizing school websites and e-newsletters to communicate with parents, there still seems to be a steady stream of papers coming into our home. There are field trip permission slips, worksheets, artwork, reports, tests, fundraiser flyers, notes from the nurse’s office about lice, and announcements about upcoming school-related events. That’s a lot of paper, especially when you multiply that by the number of children you have attending the school. Thankfully, our school sends home almost every important paper in Friday Folders, so it’s easier to manage. 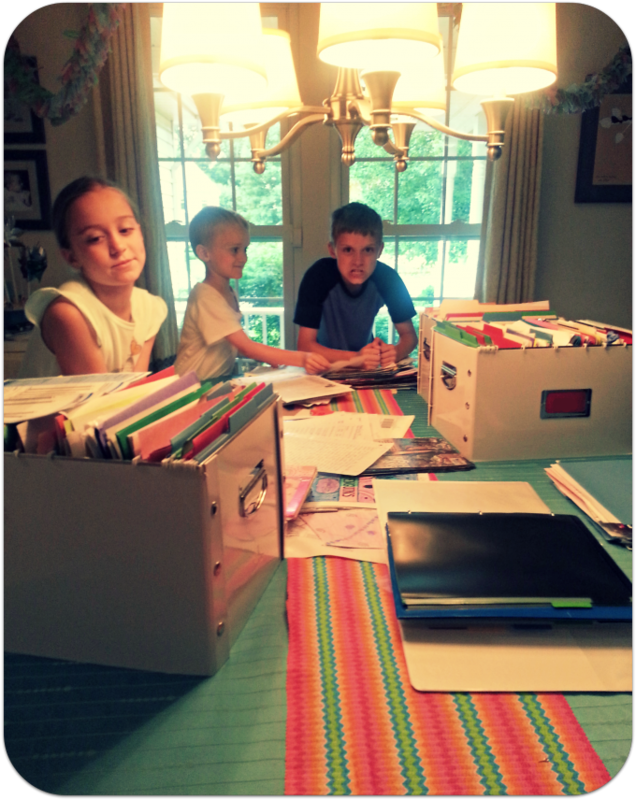 As soon as we get home from carpool on Friday, all the children hand me their folder. I sit down with my planner (or Google Calendar open on my phone) and I immediately record important dates of upcoming events. I take a look at upcoming tests and projects due. I put the due date for a project on my calendar with a reminder the week before. 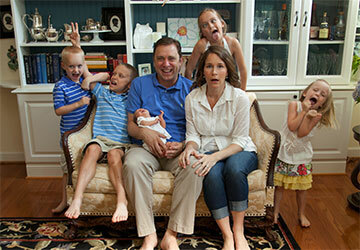 This helps us to avoid an undue stress. The flyers go straight into the trash. Sometimes I’ll hang them on the fridge if it’s something the children need to remember, but that’s rare. I put all school work in each child’s stackable bin. I purchased mine at The Container Store a few years ago. I sure wish I could say that I save all the flyers to be used later for scrap paper and drawings, but I don’t. Maybe that should be a goal for our family this year? Then once a month the children go through the papers in their bin and decide which ones they want to keep. They place them in a big three ring binder in page protectors. I encourage them to throw away a lot of these papers. Worksheets usually do not get saved. Tests and special projects do. Then at the beginning of summer break, each child chooses which saved items they want to put into their save box. This is a lot of steps, I know, but what I find interesting is that at first glance, everything is an important paper. Then at the end of the month, half of the papers in their bin are important enough to put in the binder. And at the end of the year, a quarter of those papers are important enough to place in their save box. So perhaps the steps are teaching the children. I always tell them, “What do you think you’ll have fun showing your kids or looking at when you’re a grown-up?” In fact, I got out my save box and showed them some of the special reports and projects I kept. They’re learning. Any papers that need to be looked over by my husband and I go into our action item bins. I found ours at a consignment store. I love how easy it is to pick up and move when I need to clean the glass on our desk. 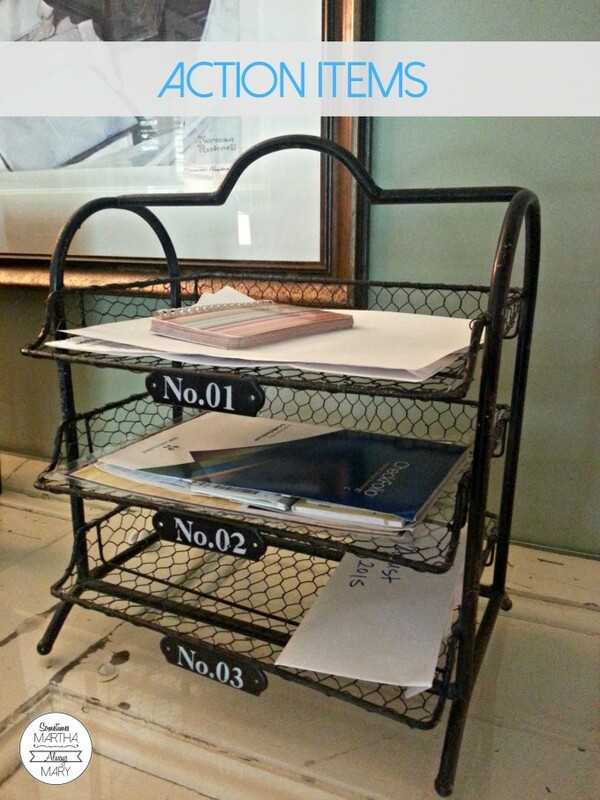 Number one is The Hubs’ bin, number two is my bin, and number three is for receipts. (Each week, we enter all of our expenses into Mint and so the receipts come in handy for The Hubs as he categorizes purchases we’ve made.) So, if there is a test paper I think The Hubs would like to see, I place it in his bin and we look at it together with the child. This system works great for us. 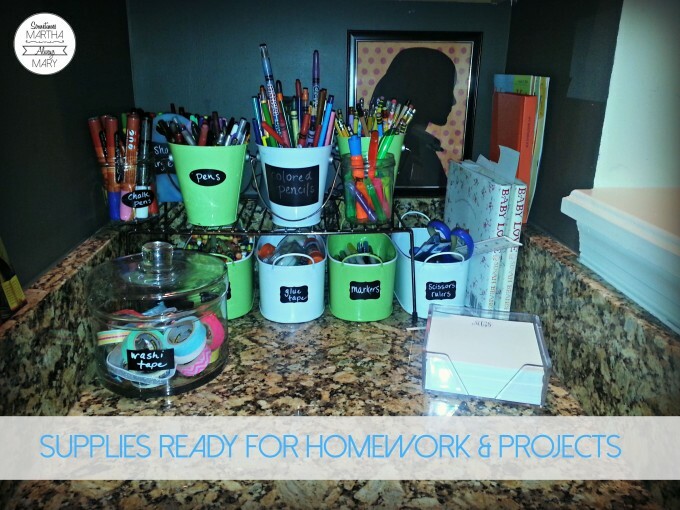 When you have elementary school kids in the house, colored card stock, lined paper, plain white paper, construction paper, tape, markers, crayons, colored pencils, glue, glue sticks, scissors, pencils, erasable pens, tape, stickers, poster board, and highlighters are tools you should have on hand. You never know when your child will need these supplies to make a birthday card for a teacher or a poster for a student council campaign. Some fun extras that my kids like are a light box for tracing, washi tape, baker’s twine, and glue dots. Here’s how I contain it all, keeping it accessible and close to the dining room table where they like to work. I also keep my baby books and a kid’s quote book here so that I remember to write in them every once in a while. Right next to the baby books are my Second Grader’s Magnifikids. We subscribe to Magnifikid for the year preceding First Communion. I have file folders standing up in a file box for things like works in progress, lined paper, plain white paper, return address stickers, babysitter info, and artwork to be photographed. What’s the what? Well, I take pictures of my children’s art projects and then I throw away about 90% of it. The pictures get put into a scrap book at the end of the year. (I am so behind on this! Somebody, please whisk me away on one of those scrap booking weekends!) 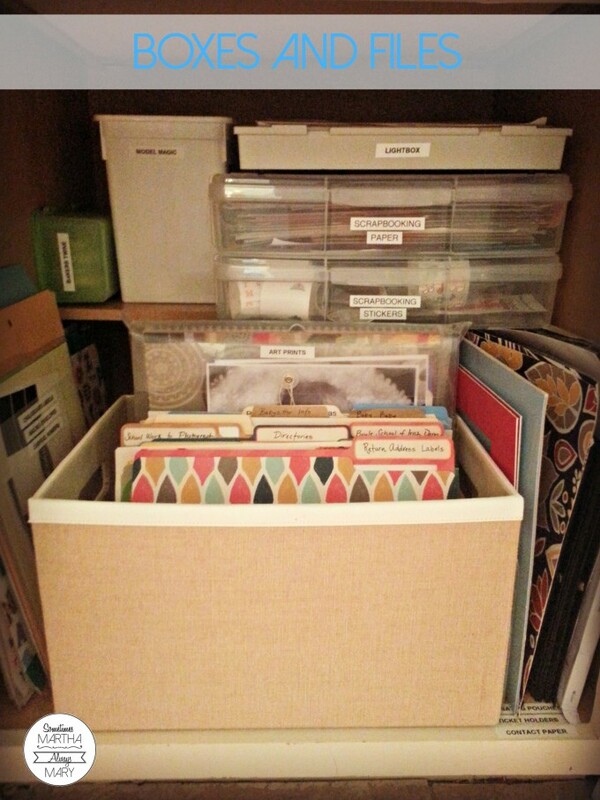 Then for the card stock and stickers, I use 12×12 clear boxes. We use these a ton, especially for homemade birthday cards and project posters. I have Model Magic in my home at all times. My preschoolers and toddlers love this stuff and it’s a great way to keep them occupied while big brothers and sisters are trying to get their homework done. 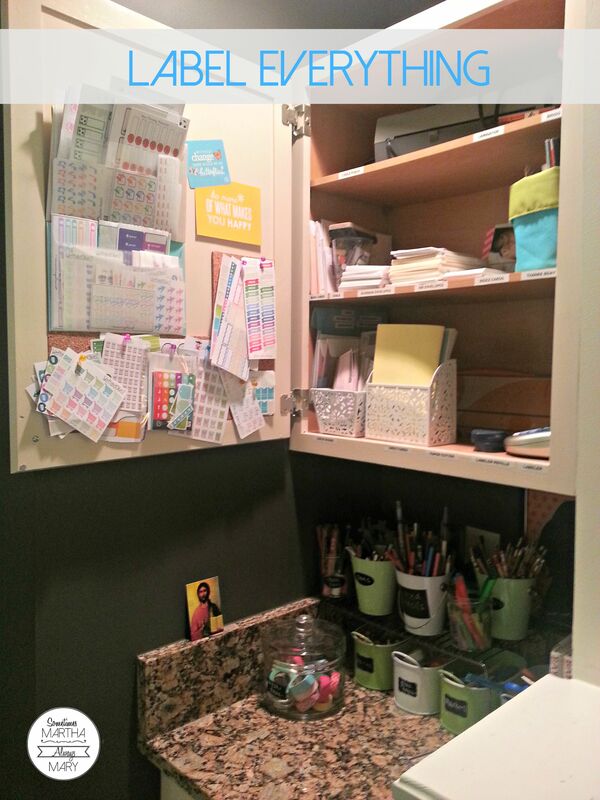 In the upper cabinet I have all kinds of office supplies: index cards, envelopes, my labeler with label tape refills, a paper cutter, a table top laminator, three hole punch, school directories (I never get rid of these. You never know when you’ll need an address or phone number), birthday/thank you/sympathy/Mass cards. On the door I have little cork boards so I can pin all my Erin Condren Life Planner stickers where they’re easy to see. I’ll get more into that addiction in tomorrow’s post. 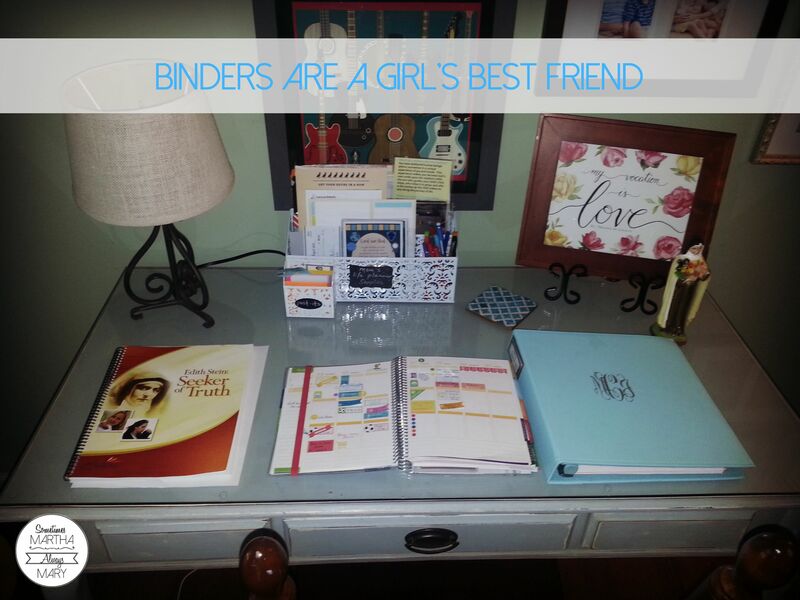 Binders are truly a girl’s best friend. Let’s go back to the Friday Folder session. 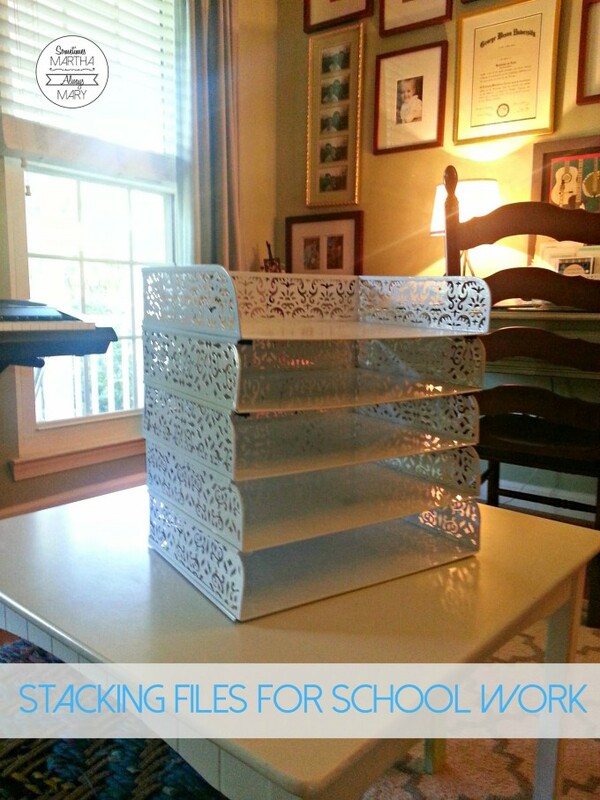 I throw away the flyers, and I place the kids’ school work into the stackable bins. What about papers that I need to keep? I’m referring especially to the stuff you get at the very beginning of the school year as well as the weekly newsletters. Some teachers at our school send home a weekly newsletter either in the Friday Folder or on Mondays. They also post them on the school website. I keep the newsletters in a binder. You can see it in the picture below. I use my three hole punch and I place all important information from the school office and teachers in this binder. I also like to put the outline that teachers send home for projects in this binder. This is my way of teaching the children how to take care of important information. It’s also saved us from many “I can’t remember what I’m supposed to do!” situations. There is a section for each child with their teacher’s name on it as well as a section for overall school communication. After the Hubs and I have addressed action items in our “Number 1-3” bins, then we put them in this hanging file box that stays on our desk. Once a month, I take this down to the basement and place all these papers in our big metal file cabinet. It’s my dream to someday have a pretty wooden one that we could keep right in the office. Until then, the black metal thing from Staples is hidden away in our basement. As far as school papers go, the only ones that we would keep in our big filing system would be tuition statements. Otherwise, it goes in the trash. Again, getting rid of as many papers as possible is the goal. OY VEY the emails! First and foremost, suggest to your room parents that they utilize Sign Up Genius !!! This is absolutely essential. Please, room parents of the world, stop flooding our inboxes with requests for class party, class trip, teacher gift, and charity donation REPLY ALL’S! For the love. Sign Up Genius is simply the best. You create a list of all the things you need from the families in your child’s class and they sign up. Then Sign Up Genius sends each parent a friendly reminder of what they signed up to send in to school! It saves you room parents time and headaches, for sure. And it keeps all the parents in your class from going nuts with all the reply all’s. At the beginning of the school year, I create a folder in my email account that has the grade, name of the teacher, and school year as the title. When an email comes in, I read it as soon as I am able, answer it as quickly as I am able, then file it. I try not to ever delete email correspondence with the school. I have a folder for the principal/secretary and one for the school nurse as well. Then I create a separate folder for the e-newsletters that are sent out each Friday. Before I send them to their folder, I read the whole thing from start to finish, recording dates for upcoming events on my calendar. Do not underestimate your school’s Friday Newsletter! I look at it as part of my job as the mom and manager of our family to read this. One time I slacked off and ended up missing “Have Lunch with Your Child Day.” That was humbling! Poor babies. Just another thing for them to cover in therapy some day. Sometimes, there are emails that get sent out to parents from other parents. I’m sorry, but I have absolutely no tolerance for gossip about the school or a teacher in a group email. Thankfully, this has only happened once in my five years at our school. These emails go straight to trash where they belong. I have a husband and a couple of trusted friends who I turn to when I need to vent. And that’s all I have to say about that! Please feel free to leave a comment or email me with any questions you may have. I love being helpful and I really love feedback. I appreciate it and I hope this has been helpful to you. 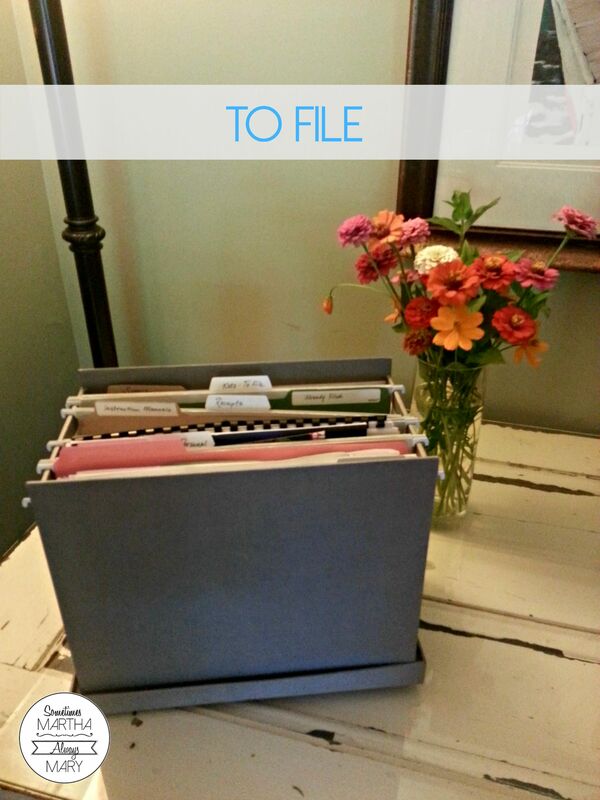 Your system for organizing school papers is genius. I don’t have school age children yet (and we’re likely planning to homeschool) but I’m going to file away (you see what I did there ;)) your system to glean ideas from when we get to that point. Thanks for this excellent post! Laurel! 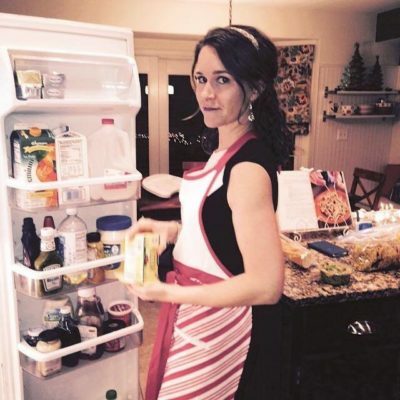 I love it when something I do in my home and explain on my blog helps another mom. I am so happy! Thank you for the kind comment. Thank you so much for this! I am definitely going to put some of these into practice! School paper clutter has always been my biggest organizational problem area and I love how you have tackled everything! I especially love the bins for you, your hubby and the receipts! Thanks, Katie! It makes me so happy to hear that this is helpful. God bless you!